What Is The Google Street Art Project? There’s a beautiful set of murals in Rio de Janeiro, a set of photorealist eyes staring at the camera. In the Chinese city of Bozhou Shi, a boy and girl share a kiss while break dancing. And in a sea of sand near Cape Town, a graffitied wall sits off-kilter, bright pink writing scrawled across its side in stark contrast to the surrounding lack of colour. I’m seeing all of this in just a few clicks, never once leaving my chair. The Google Street Art Project is an ongoing attempt to document and preserve pictures of street art around the world in an easily-accessible and easy-to-navigate database for street art enthusiasts. Started in Google’s Parisian division, the Google Cultural Institute, the database is a unique extension of the Maps project, using the company’s wide-ranging and extensive photos of the world to also identify and preserve street art. As many of us know, the world of street art is at once beautiful and fleeting. The threat of having something painted over in plain white, or washed away, or re-zoned, is at once exciting and threatening. Many of the most beloved pieces in the world, including most of the City of L.A., have lost great pieces of street art to the world of bylaws and grumpy people. Google, it seems, is attempting to counteract these notions with the permanence of the internet. The database uses a combination of professional photography and images taken with the same tech used for Google Maps to showcase street art from around the world, from Google’s hometown of San Fransisco to the cold plains of Mongolia. The app itself is surprisingly easy to use and, best of all, constantly growing. As of writing this, there appears to be over 10,000 entries, with more being added everyday. Those who want their pieces added do have to walk through some hoops, Google isn’t entirely ready to simply track every spray-can accident on the planet. Groups must supply proof of legal rights to the piece and refrain from including pieces that are planning on being sold at art galleries. But with each instance, the art is included with as much respect to the artist and the art community as it seems possible. The Google Street Art Project is more than simply a database of street art, something that other companies have been doing for awhile (the Red Bull maps come immediately to mind). Google’s size and influence makes this a political stance erring on the side of artistic expression. As lawmakers still try to debate street art as vandalism, Google is pouring money into a project that will keep many beautiful pieces preserved for art lovers. So while the mural or installation may vanish with time and bureaucracy, the art itself can stay with us, safe and sound and beautifully captured on Google Street Art. Some people hate the rain. It casts a gloomy, grey shadow over their day, makes them run from place to place, and generally gives them a gross, squishy feeling in their shoes. But for Peregrine Church, rain is just another opportunity to make the world a better place. The Seattle-based artist was browsing the internet one day when he came across a miraculous substance called NeverWet, a spray-on chemical that doesn’t allow the surface on which it is applied to get wet. Instead, the water or liquid washes away, leaving the surface completely dry. There’s videos of it online that show people in white shirt’s getting doused in red wine to literally no effect. And since the product is environmentally-friendly and non-toxic, it can be used on pretty much any surface to keep it dry without any nasty side effects. And while Church probably got a kick out of watching this miracle substance, he soon thought of an even cooler way to use it. Not to keep clothing dry and stain-free, but to make people’s rainy days a bit less gloomy. Church created a project called RainWorks, a special street art project that uses this miracle substance to make street art that only shows up when it rains. Based in Seattle, that can be a pretty frequent occurrence, but one that can still brighten someone’s day. Church’s process is fairly straight forward. He loads the chemicals up into spray bottles and designs stencils that can placed on the sidewalk, his favourite medium for RainWorks. With a few sprays from the bottle, the piece is set and, come the next rainy day, people passing by can catch a glimpse of this invisible and uplifting art. 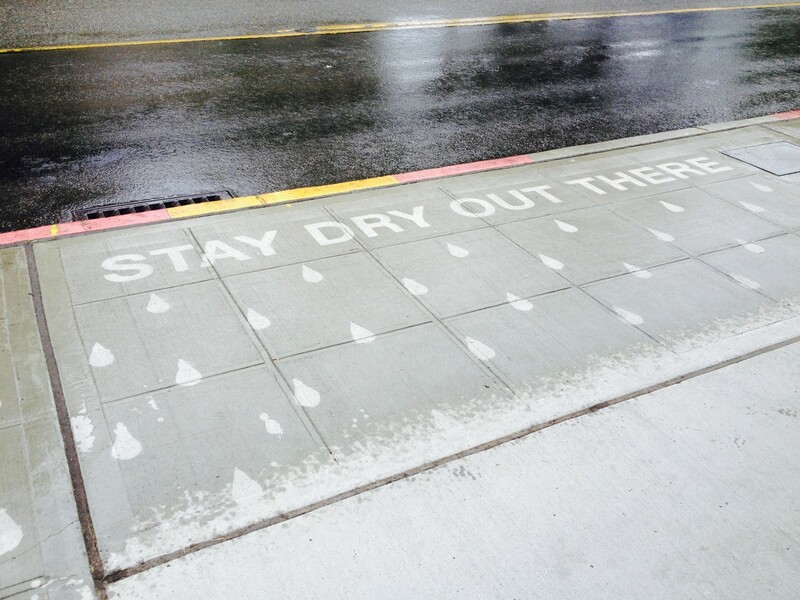 The first RainWorks was simple: a sign that said “Stay Dry Out There” at a bus stop with some (ironically enough) completely dry patches of sidewalk that looked like raindrops. There’s now over 30 RainWorks pieces scattered throughout Seattle, and they vary in size, scope, and style. But every single one of them is about giving people a positive message on their rainy days. Some are little jokes, like one that says “Today’s forecast: rain,” while others are a bit more inspirational, like an elaborate mural with rainbows and lightning that says “Worry is a misuse of the imagination.” Still others are interactive, like the hopscotch. No matter what they are, Church has the same attitude: It’s going to rain no matter what, so why not have some fun with it? RainWorks is a beautiful and ingenious project that combines technological innovation with positive imagery for something that’s fun, new, and aimed at brightening people’s days. It’s not overtly political or alienating, it isn’t attempting to be something it isn’t, it simply is. And in that simple idea, there is beauty and encouragement. Rainy days aren’t the end of the world, but they can be gloomy for some people. And maybe when they stumble upon RainWorks, they’ll get a little smile and remember that life isn’t so bad after all. Most of the bios we’ve put up on this blog have been about male artists, which is not a huge surprise. Many of the world’s greatest and most influential street artists in the world have been men, and many male artists are still pushing the medium forward in new and dynamic ways every single day. But we think it’s high time the many wonderful female artists in the world get their fair share of the attention too. So today we’re going to take a look at Maya Hayuk, a street artist who’s intricate and captivating murals have shown up all around the world. Hayuk was born to two university professors, geography and psychology respectively, and spent much of her childhood travelling around the world. These experiences took her to places as diverse as Europe, Africa, and parts of the Soviet Union, where she took in many different visual styles and approaches. As she grew up, Hayuk’s education and work took her from her hometown of Baltimore to Richmond, Boston, Toronto, San Francisco, and eventually Brooklyn, where she now resides and works full-time in her studio. With their intricate patterns and love of bright colours, Hayuk’s various murals draw a most direct influence from the former Soviet Union. The patterns are tight and intricate, much like what’s commonly found on Easter eggs. The strong use of geometric shapes are captivating, inviting a closer and longer look at all the moments that exist within each of her works. Hayuk herself describes her work as “bright, massive, intricate, and joyful, which is a pretty great summary for her work. Most of her murals are painted in bright colours and done on a large scale, anything from the entire side of a building to larger canvases that have hanged in galleries around the world, including her current residence of Brooklyn, New York. The sheer size of Hayuk’s work could make for something imposing and overwhelming, but her use of shape and colour creates something just the opposite: a work that’s at once intimate and large, inviting while all-encompassing. These qualities were brought out to their fullest in her latest exhibit at UCLA’s Hammer Museum. Taking up the entire entryway of the museum, Hayuk’s murals greeted everyone who came in for nearly six months. Hayuk’s latest work was part of the Bowery Mural on Houston St. in New York. The Bowery Mural Project is part of ongoing changing wall, where artists paint it up and have it replaced by another later on. It’s an amazing space to showcase local, emerging, and accomplished artists, with Hayuk’s piece being no exception. 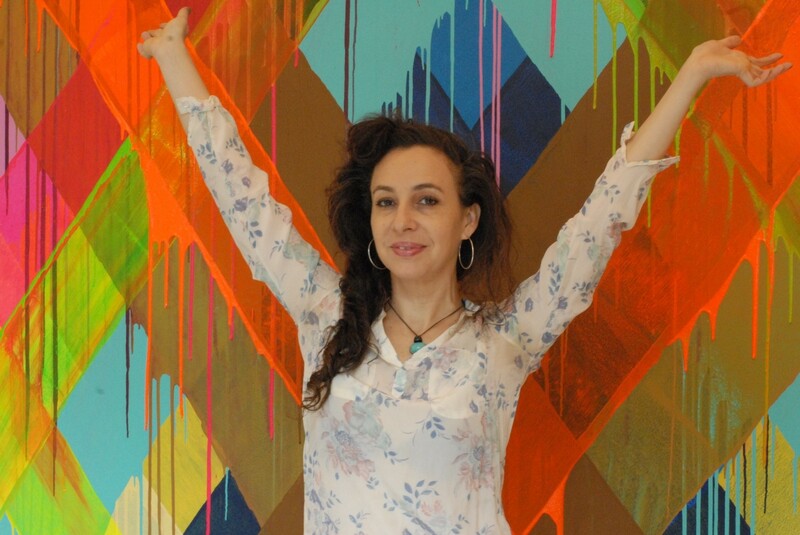 Hayuk’s work is at once beautiful and full of life and proof that women are changing and impacting the street art industry in profound and new ways. As with all aspects of life, inclusion and diversity leads to change and a general raising of the work that’s out there. And for artists like Maya Hayuk, it means we have a better chance of encountering new art that can make us feel and think in different ways.